More than 55 community members from the Mabopane area are registered in the Sizani Program and are regularly attending the different training sessions at the Lesedi la Batho Centre in Mabopane. Although the group is primarily aimed at unemployed young mothers, we do have a handful or unemployed men in attendance who also want to improve their future prospects. All skills training services are provided free of charge to any interested community member. The main objective of the Sizani Skills Training Program is to improve the quality of life of both vulnerable young women and their children. The skills training encourages the participants to become empowered, financially independent, and self-sufficient members of the community. The group is split between the different workshops and then rotates after 2-3 months in each. After each workshop, we have a graduation ceremony to mark and celebrate the completion of the workshop and each group members gets a certificate of attendance before moving onto the next. Computer Training - The women receive basic and more advanced computer training. Internet is provided at the centre free of charge and the women are encouraged to join social networks to practice their newly acquired computer skills in a fun and interactive way. Our computer laboratory manager is also able to assist them in creating their CV’s in order to help with employment prospects and also to apply for Job’s online. 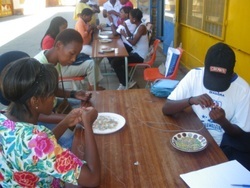 Beading and Sewing - The art of sewing and beading is being taught to the women. In this workshop, they create beautiful beaded gift bags, jewellery and other such items which they can keep or give as a gift to others. They can also sell the items which they have made on and get 90% of the profit, giving further incentive to practice and improve on their craft skills. Baby Care and Child Health Training - Basic baby health and hygiene forms part of this curriculum and aims to reduce the high infant mortality rate of babies in the area. They cover topics such as feeding, hygiene and providing the right nutrition to you baby. This course is very popular, especially with the young mothers which make up the majority of the Sizani group members. Baking and Catering - This is a project which aims to teach participants in our projects cooking, baking, preserving, catering and business management skills. It also covers basic food hygiene which is instrumental is preventing illness in the area. Each trainee is allowed to take up to R30 of produce with them after each training session and the items made are sold in the bakery.